Doc. 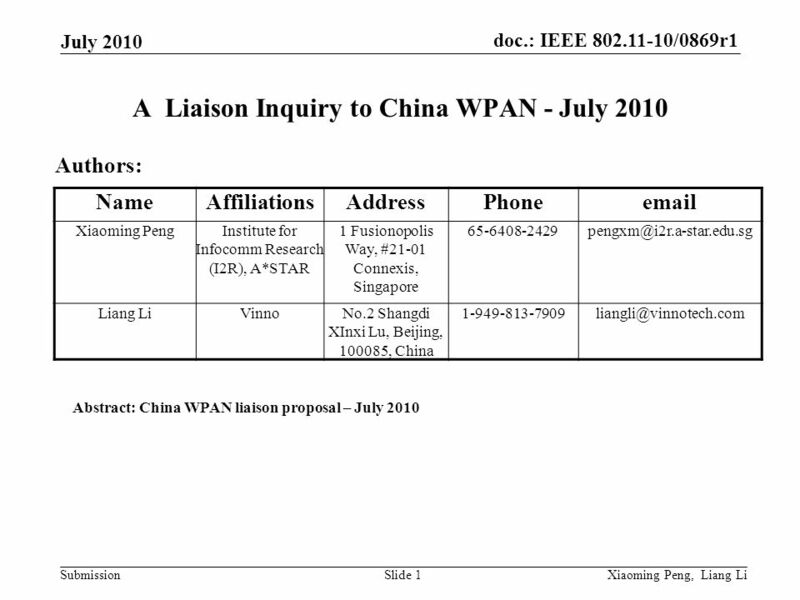 : IEEE 802.11-10/0869r1 Submission July 2010 Xiaoming Peng, Liang LiSlide 1 A Liaison Inquiry to China WPAN - July 2010 Authors: Abstract: China WPAN. 2 doc. 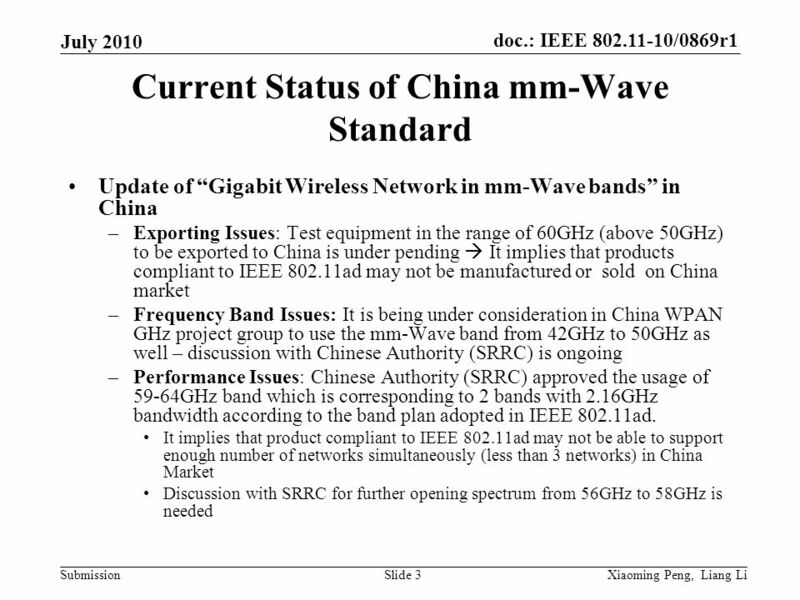 : IEEE 802.11-10/0869r1 Submission July 2010 Xiaoming Peng, Liang LiSlide 2 Background In May, on Beijing meeting, IEEE802.11ad passed the D0.1 draft. 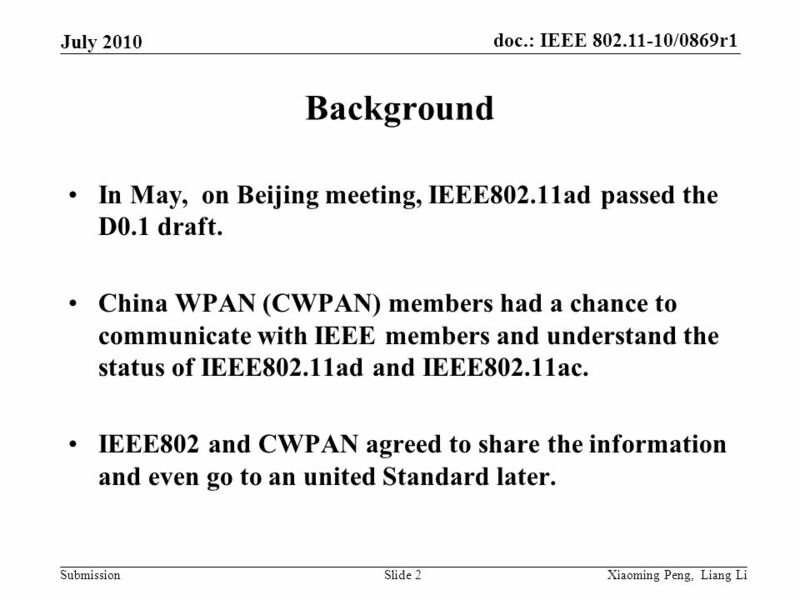 China WPAN (CWPAN) members had a chance to communicate with IEEE members and understand the status of IEEE802.11ad and IEEE802.11ac. IEEE802 and CWPAN agreed to share the information and even go to an united Standard later. Download ppt "Doc. 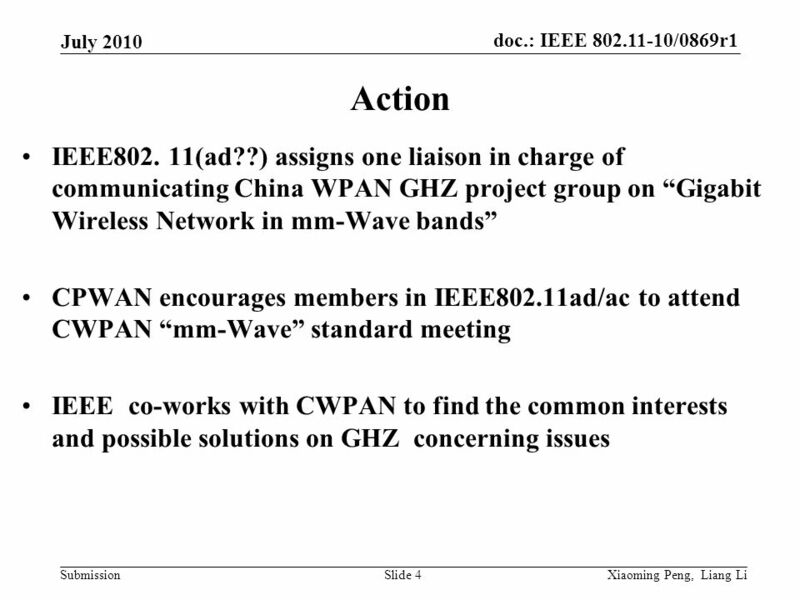 : IEEE 802.11-10/0869r1 Submission July 2010 Xiaoming Peng, Liang LiSlide 1 A Liaison Inquiry to China WPAN - July 2010 Authors: Abstract: China WPAN." Doc. : IEEE /180r2 Submission Mar04 Reed Fisher OkiSlide 1 Project: IEEE Working Group for Wireless Personal Area Networks (WPANs) Submission. Doc. : IEEE /0044r0 Submission July 2010 John R. Barr, JRBarr, Ltd.Slide 1 IEEE 802 Submission to ITU-R on 60 GHz Notice: This document has been. Doc. : IEEE /0647r1 Submission May 2010 Bruce Kraemer, MarvellSlide 1 +1 (321) Marvell Lane, Santa Clara, CA, Name Company. Doc. : IEEE /0824r2 Submission July 2010 Carlos Cordeiro, Intel CorporationSlide 1 Response to ITU-R Liaison to IEEE on Multiple Gigabit Wireless. Doc. : IEEE r0 Submission July 2010 John R. Barr, JRBarr, Ltd.Slide 1 Project: IEEE P Working Group for Wireless Personal Area Networks. Doc. : IEEE /021r1 Submission December 2000 Jeyhan Karaoguz, Broadcom CorporationSlide 1 Project: IEEE Working Group for Wireless Personal. June 2005 doc:IEEE b Slide 1 Submission Liang Li, Vinno Inc. Project: IEEE P Working Group for Wireless Personal Area Networks. Doc. : IEEE 802.11-13/0433r0 SubmissionSlide 1 Date: 2013-04-24 Presenter: MAC Protocol to Support Dynamic Bandwidth for 802.11aj (60GHz) Xiaoming Peng.